Quaint and luxurious, the Cabinet House is ideal for an extended stay or a romantic New Mexico honeymoon. Built in the late 1890s, this charming cottage is nestled behind the Spy House and the Heritage House. It served as a rental for many years before becoming part of the Downtown Historic Bed and Breakfasts of Albuquerque. The bedroom features a cozy king-size bed. Next to the bedroom is a large living area with a sofa that converts to a queen-size sleeper. 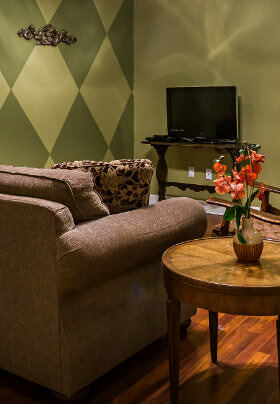 The Cabinet House offers cable TV and free high-speed wireless Internet. 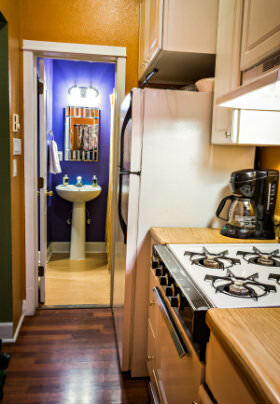 The kitchen has a stove, microwave, coffee maker, and refrigerator stocked with a variety of drinks. Dishes are provided, so that you may prepare personal food during your stay. The Carriage House also includes a private fenced-in yard, as well as a screened porch, so that you can sit outside to enjoy your morning coffee or relax at any time of the day.